While the EMU trade surplus is the lowest in three months, it is also still higher than five month's surpluses back to January 2017 and higher than anything before November 2014. The 12-month average for a surplus is 20.1 billion euros and January's surplus is really about the same number at 19.9 billion euros. That is thin gruel for deficit reduction progress. Moreover, there does not seem to be much in the way of fundamental progress afoot. EMU manufacturing exports are accelerating from a pace of 8.0% over 12 months to 11.9% over six months to 17.9% over three months. 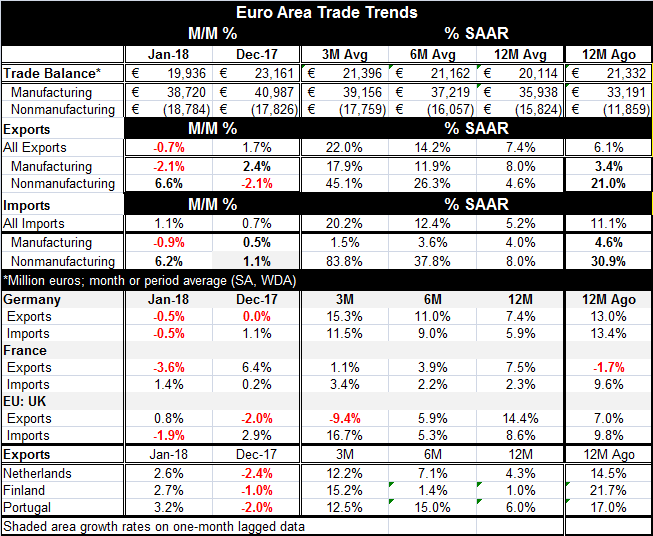 At the same time on these same horizons, manufacturing import growth is fading from 4% over 12 months to 3.6% over six months to 1.5% over three months. The fundamental forces on the deficit/surplus from the pattern of manufacturing export and import growth rates is clearly to make the underlying surplus larger despite January's result. However, the impact of manufacturing trade on the actual surplus is suppressed because of trends in nonmanufacturing trade. These trends are more fickle and often driven by oil and other commodity prices. Nonmanufacturing exports are accelerating from a 4.6% growth rate over 12 months to a 26.3% pace over six months to an eye-popping 45.1% over three months. And growth rate like that would seem likely to combine with strong manufacturing exports to push the surplus even higher. And it would, except that as strong as the nonmanufacturing exports are, nonmanufacturing imports are nearly double their pace on all horizons at 8% over 12 months, 37.8% over six months and 83.8% over three months. Trade deficits are being dominated by its nonmanufacturing flows. Since commodity prices swing widely, we have no real sense of how the EMU current account is going to be affected in the future. Spurting oil prices are behind this push for now as Brent prices are up and nearly 100% annualized rates over three months and six months and up by 24% over 12 months. In all likelihood, oil prices are due for an unwind especially based on IEA expectations for this year as it sees supply outstripping demand. If that happens, the underlying growth for manufacturing trends should push the EMU trade surplus back up as import growth recedes. Trade has become a real hot potato. And trade numbers are going to be in the news and highly scrutinized. There are many different opinions on trade. Some people think more trade is good. But trade alone is not free trade. And trade with imperfections to the Free Trade model can and will - and has- made distortions. Some people say that our global trade is close-enough to free trade and we should just 'pretend' that it is good enough and move on. But to do that is to ignore some well-traveled ground in economics. The theory of second best is studied to acquaint economists with the idea that if a system cannot get to the first best state, then the second best state will be SOMETHING DIFFERENT. In other words, if there are imperfections in your free trade system, you would not want to go ahead and act as though you have a free trade system and so all the same things because that will not produce free trade results. In fact, we have witnessed in the introduction of distortions under this system that has been operating since 1971 as we have developed chronic deficit and chronic surplus countries and as trade patterns have become ossified instead of dynamic. With Donald Trump acting as main disrupter, in general the world economy is being forced to go through the paces of inspecting what it has been up to. For years that mantra of more trade is better has been uttered while the U.S. current account deficit become bloated and intractable. Now suddenly some want to call out the system as uncompetitive and unfair and that has made people wary. But facts are facts and trends are trends. And free trade really does not have 'specialty' producing and consuming nations. What has evolved is clearly a system based on trade that has been rigged in several ways. Within the EMU, Germany is running a current account surplus as a ratio to GDP that is second to no industrialized country in the world. Trade trends are going to be in the news so it's a very good time to think about the precepts of free trade and not just commercial policy. We know that lower tariffs are better than higher tariffs. But to work and to get all the benefits of real free trade, trade must be open as possible on all sides and transactions need to occur at market prices free of distortions and free from subsidies as well. These conditions make trading with China suspect since state-owned enterprises are so prominent and can hardly be said to be part of a free and open competitive system (although China has been lobbying for that designation). Also bank lending in China is directed and the exchange rate is controlled and is not market-determined. Countries that have manipulated their exchange rates are mostly easy to identify. They run persistent trade surpluses while adding to foreign exchange balances; they fail the free market test. Of course, all of this is sort of submerged by the fact that for a long time it was pretended that what we were engaged in was free trade and the fact is that its flaws and skewed results were overlooked. That was custom and practice. So now many are unwilling to look with fresh eyes upon the flawed system that once was revered as pure. But this epiphany is only a logical outcome in the wake of a financial crisis in which we discovered that the U.S. financial system, once thought to be paragon of propriety, had rot set in and settle deep into its structures. Donald Trump is using the threat of commercial policy as a way to try to open up the system not as a substitute for performance. I have no idea if he has a grand plan to rehabilitate free trade or not. But looking the other way has never been a strategy for success.